Vijender Singh’s debut in the United States, scheduled for April 12, was postponed after he injured himself during a sparring session in Los Angeles. The 33-year-old, India’s first Olympic medal winner, was to make his US debut at the Staples Center on the Vasiliy Lomachenko-Anthony Crolla undercard. It was to be an eight-round contest and his opponent was yet to be decided. Having turned pro in 2015, Vijender is so far unbeaten in his 10-bout pro career and claimed the WBO Asia Pacific super welterweight title during his stint in England. “I can’t recall the name of the guy I was sparring with but I got hit by his elbow. It is disappointing to be held back by something like this but I believe whatever God does is always for the best. So, I am sure he has a better plan for me,” he added. Asked if a new date for his debut US fight has been decided, the Haryana pugilist said it will only be known once his injury heals. “Because apart from this, I am really enjoying training here. I am really looking forward to make a name for myself here.” he added. 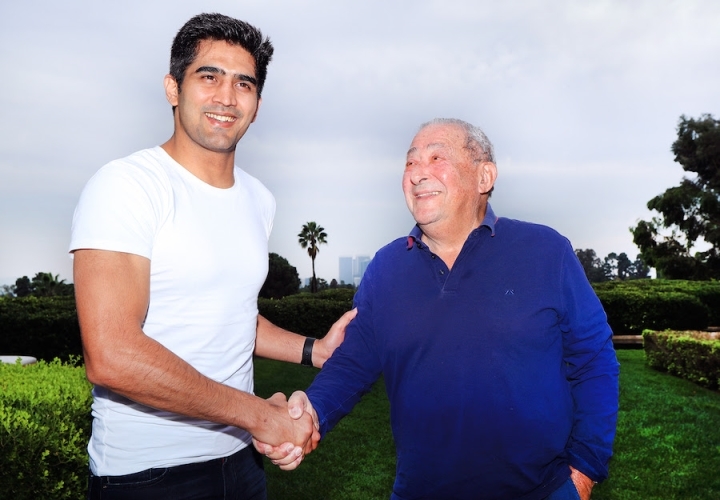 Vijender, represented in India by IOS Boxing Promotions, relocated his training base to Los Angles earlier this month after signing up with Top Rank. He is training at the ‘The Wild Card Boxing Club’ under Roach. 2-3 years to make something happen. I wonder if his style is too “amateur”?